Auto-Tune for Guitar Custom Installation Kits, Other Guitar Accessory from Antares Audio Technology in the Auto-Tune series. 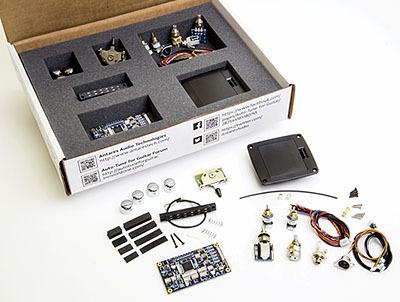 Guitar makers and DIY fans who wish to install an Antares Auto-Tune system can order Custom Installation Kits now. 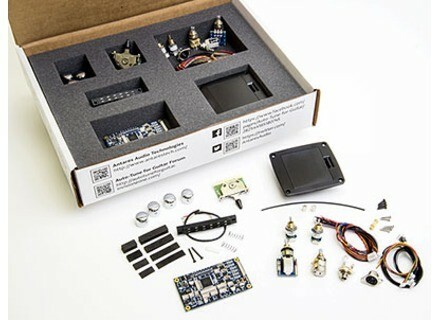 Already available on certain guitar models, the automatic pitch correction, guitar/pickup modeling and alternate tuning tool by Antares is now being made available in the form of a DIY installation kit including a processor board, controls and pickup. The manufacturer promises the kit will have a minimal impact on the looks of the guitar. The Auto-Tune Custom Installation Kits can be installed on most guitar configurations (Stratocaster, Les Paul, Telecaster and others) and can be customized with different options (pickup selectors, pickup widths, number of control encoders, etc.). The kits can only be acquired through professional guitar makers who have been accepted as Authorized Auto-Tune for Guitar Installers. [NAMM] Carlsbro VAC15 Greenback Classic Carlsbro will introduce at NAMM 2014 a limited edition of its VAC 15 guitar combo equipped with a Celestion Greenback speaker.